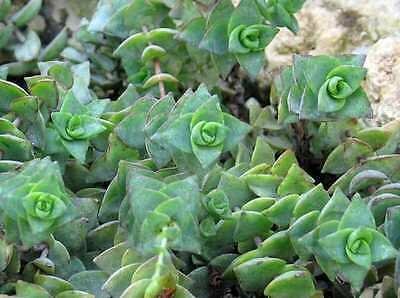 The String of Buttons, Crassula perforata, is a cute sculptured succulent that is easy to grow and maintain. Buy String of Buttons online for a healthy succulent and fast delivery. Also called Necklace Vine, this Crassula succulent is 6cm, just over 2” that will grow to become a beautiful plant. This is a relatively fast growing “stacked” Crassula from South and Eastern Cape Province of South Africa north to Natal. It is a somewhat shrubby and sprawling plant to 18 inches tall with secondary branches rising nearly vertically bearing short broad ovate opposing leaves that are congested at the leaf tips and blooms with inconspicuous pale-yellow flowers in spring. This form has leaf margins that often have reddish tinges and is quite showy. Plant in a well-drained soil in full sun to light shade – needs some protection from midday heat in hot locales but the brighter light brings out the red tones and plants will flower more. Irrigate only occasionally. This succulent is also commonly called Pagoda Plant, String of Buttons, Stacked Crassula, Necklace Vine, Crassula Baby Necklace, Baby Necklace Succulent and Baby’s Necklace. The String of Buttons looks great growing alone or with other succulents in an arrangement. String of Buttons are popular to use in terrariums and in hanging baskets. These also look wonderful in an outside garden and are very hardy. They are aggressive growers and work well as a ground cover or as a simple border plant. Once the plant matures it can easily be propagated from divisions, leaf cuttings and offsets.